Motorola is looking to revamp its brand portfolio with the upcoming Razr 2019 and One Vision pphones. The Razr series rose to prominence with the unique V3 handset from the early 2000s. With the introduction of foldable phones, it looks like the company is ready to revive it with a very modern twist - foldable display. Last month, reports brought more light on the device’s key specs such as its 6.2-inch foldable screen and Snapdragon 710 SoC. Today, the device codenamed Voyager received its certification from Bluetooth SIG, suggesting an official announcement is just around the corner. 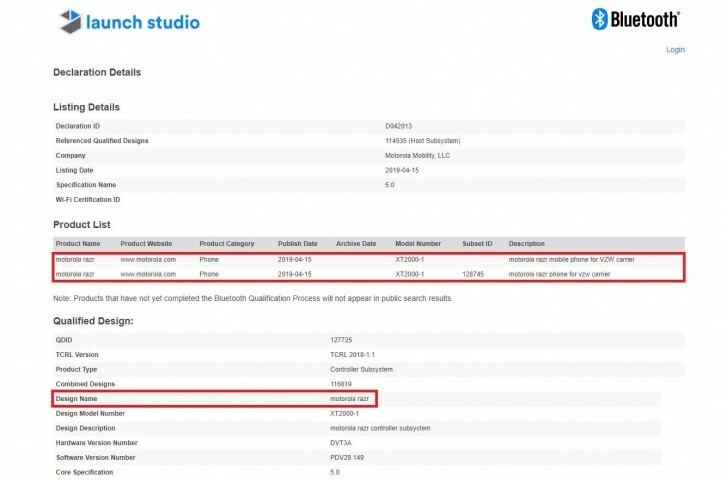 From the certification description, we can clearly see the device will be a Verizon exclusive for the US while it remains to be seen if we’ll see it on the global stage. We also see that the upcoming phone will feature Bluetooth 5.0 support. Rumors point to a $1,500 launch price which will make the device more competitive in the foldable segment compared to the $2000 Samsung Galaxy Fold and $2,600 Huawei Mate X.
Alongside the Razr 2019, the Motorola One Vision also received its Bluetooth certification. 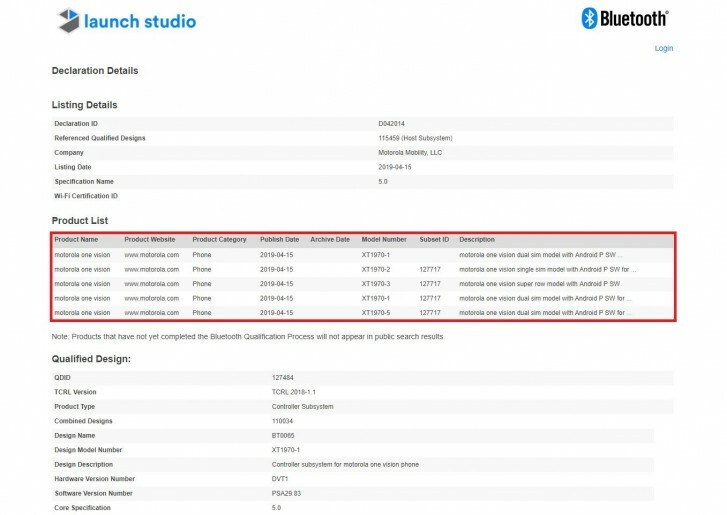 Four variants of the device equipped with Bluetooth 5.0 appeared on SIG's site. From its Geekbench listing, we know the device will feature a Samsung Exynos 9610 SoC paired with 3GB or 4GB RAM and storage in the 32GB-128GB range. The phonewill be part of the Android One program and will run Android 9 Pie out of the box. It will feature a 6.2-inch FHD+ punchhole display with a dual 48MP + 12MP rear camera. Man you need a bigger pants ora special one mades with increased pocket size.